Custom guidon framing is a very popular framing service we offer. 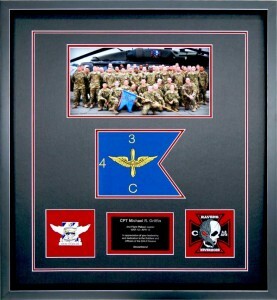 Custom guidon framing is a premium upgrade option over the standard guidon packages for sale in our e-commerce store. Example of a 7th Cavalry Crazy Horse Troop custom framed guidon. This guidon design is similar to the designs in the e-commerce store. The standard guidon frame packages in our e-commerce store represent the most frequently requested guidon frame designs. The standard package is configured in 4 guidon sizes, with 3 designs, and 3 frame selections for each size. In addition, we offer 4 nameplate selections. The example on the left features the 7th Cavalry Crazy Horse Troop guidon. The guidon and objects are triple matted with acid-free etched black and red suede mats. Objects below the guidon include the 7th Cavalry crossed sabers pin, rank pins, custom name plate and, challenge coin. This example is similar to the framed guidon packages we offer in the e-commerce store. However, we recognize that the standard guidon packages in the e-commerce store will not satisfy the guidon framing design requirements for every customer. We know this because we design and build custom guidon frames frequently. The objective of this section is to suggest ideas for custom guidon framing. 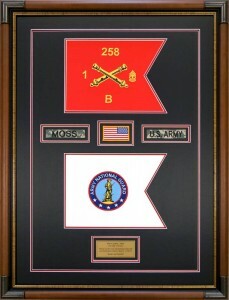 Custom guidon framing offers many design possibilities featuring memorabilia framed with a guidon. We offer mat colors and frame style options as alternatives to the ones shown in the e-commerce store. Below are examples of custom guidon frames we completed for customers in the past. Countless variations are possible for any of these. If you wish to have a guidon custom framed, please contact us. 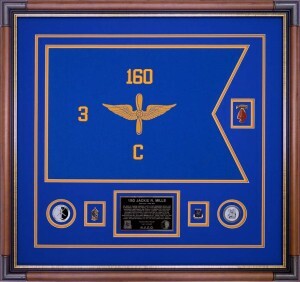 Custom guidon framing presents unique design opportunities for customizing frames for flown guidons. The example on the left is from Headquarters 26th Brigade Support Battalion, 2nd Brigade Combat Team. This guidon was flown, and it shows wear from its use in the field. 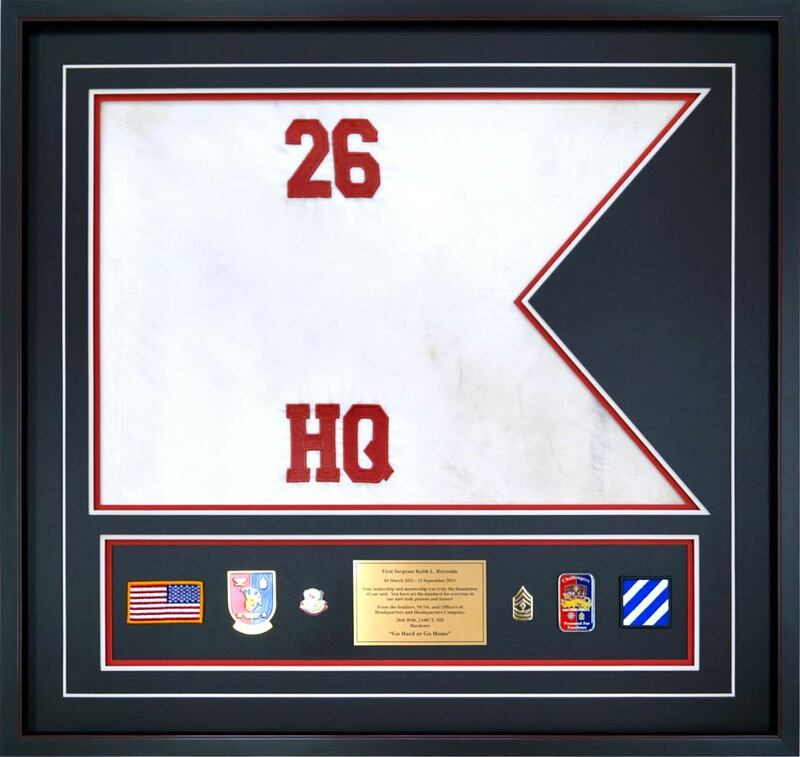 This example features a furnished, regulation size guidon flown under a command. This custom guidon frame features quadruple acid-free matting. The top mat is etched black; the second mat is white; the third mat is red suede; the fourth mat is etched black. A medium brown all wood frame with metal corner caps is normally the standard frame used in our guidon design package. However, the customer elected to use a black frame with red line edging instead. This was a good choice. It enabled the black frame to contrast well against the white guidon and multiple-colored mats. A single opening beneath the guidon holds the objects — patches, distinctive unit insignias, 3rd ID patch, and rank pin. This opening differs from the standard design for openings in the guidon package. In addition, this design features an oversize custom nameplate. Matching a custom guidon frame design to your requirements is our custom guidon framing mission. Can I furnish my own guidon? Yes, customers can definitely furnish their own guidons. The illustration above reflects customization that can be included with a flown guidon. Can you make me a shadow box for a guidon? Yes, this is done routinely for our customers. 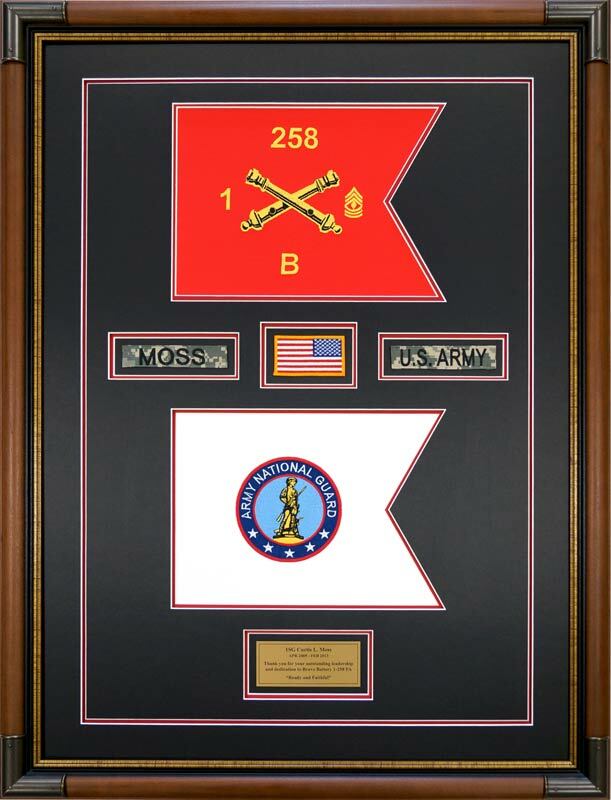 We can modify a guidon design with a deeper frame to make it a shadow box. (See examples here.) Customers make this request because they want to include additional or larger mementos with the guidon. For example, they may wish to include objects such as a knife, replica weapons, or mementos that reminded them of their command. Can I put more than one guidon in a frame? Yes, this can be done. The example on the left features a pair of custom embroidered guidons that the customer wanted placed in the same frame. The top one is a custom cotton embroidered field artillery guidon (B Battery 1st Battalion 258th Field Artillery). The bottom guidon is also a custom embroidered cotton guidon with the Army National Guard Seal. Both guidons are 7”x5”. The frame design utilizes a uniform name tape, an American flag patch, and the US Army uniform tape to separate the two guidons. Below the bottom guidon is a custom nameplate with a statement of appreciation. The guidons are triple matted with an acid-free etched black top mat top, a red center mat, and an etched black bottom mat. An open V-groove surrounds the objects. 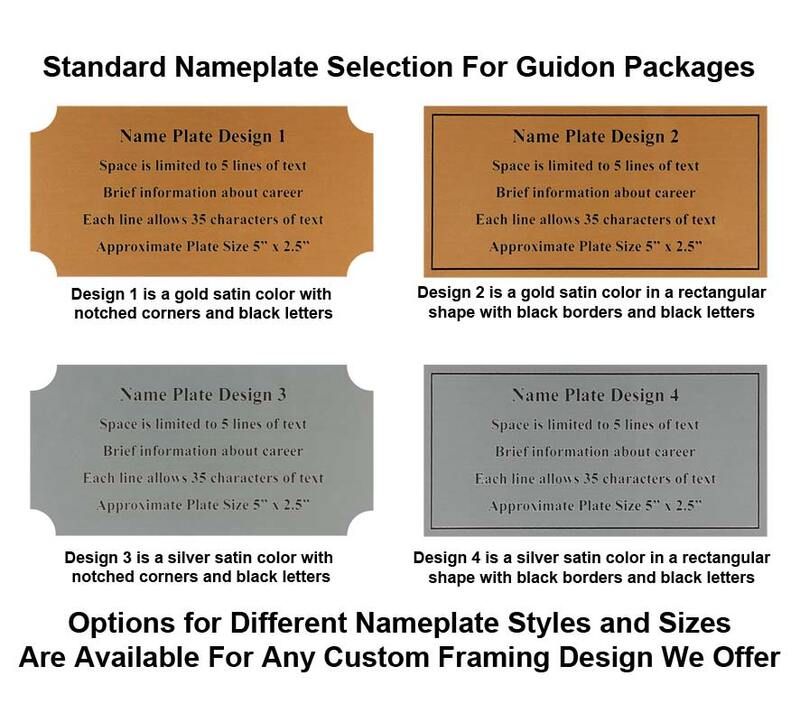 The frame selection is very popular for guidon framing. It is made from all wood and has metal corner caps. We can also place a folded flag in the same frame with a guidon. And we can configure it with mementos. We custom frame flags as part of our picture framing business. See our section on flag cases. Can I add extra medals, ribbons, and patches to the guidon display? Yes, we can make a custom frame design change for additional objects. Examples of additional objects include pins, insignia, making a larger a nameplate, ribbons, medals, certificates, awards, and additional mementos. The combinations are endless. Can I just use one mat in the guidon frame design? Yes, but the preferred way to frame a guidon is to use multiple mats. Using a single mat requires us to “top mount” the objects to an acid-free mat. Top mounting objects is an acceptable design practice, but it is not as aesthetically appealing as mounting objects in an opening. The Ranger tab on the left has triple mats and is mounted on the bottom mat with an opening. Our standard package includes opening-mounted objects. Typically objects such as pins, insignia, nameplates, coins, etc., are attached with acid-free adhesive to a bottom mat. Then, additional mats are added. This effectively makes the object look recessed or, seated in an opening. 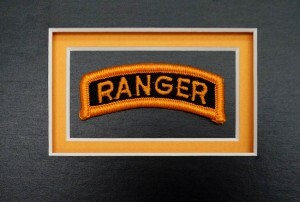 The Ranger tab example on the left demonstrates an opening mounted object. Can I include photos in a guidon frame? Yes, we will design a frame to include them. Deployment photos, command photos, and duty station photos are frequently added to a guidon frame. On the right is an example of the 4th Battalion, 3rd Aviation Regiment mini guidon with a photo. It is also another example of a customer furnished guidon. 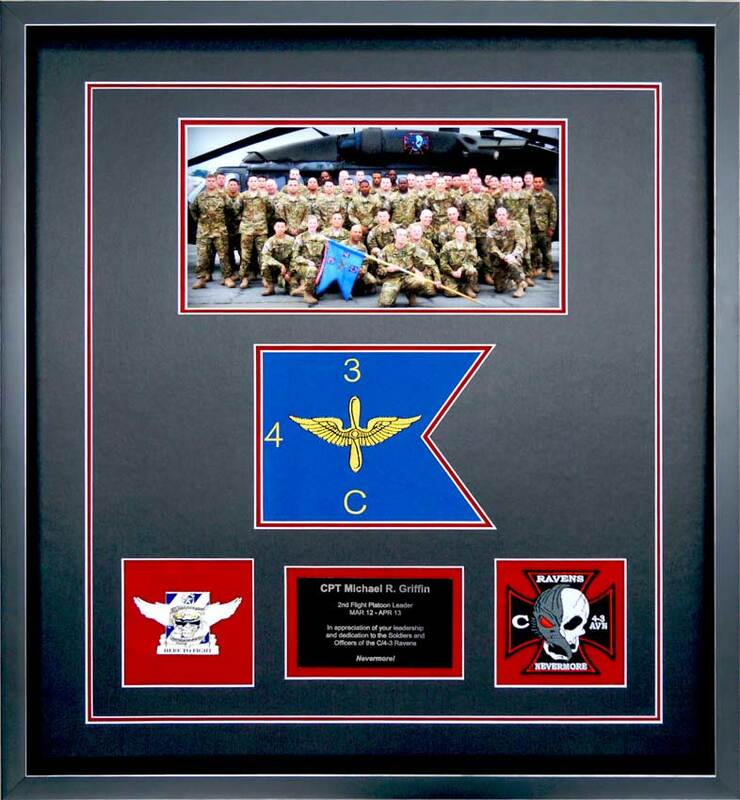 The customer wanted the 7” x 5” cotton fabric guidon framed with a photo, challenge coins, and a custom nameplate. This design also features an acid-free etched black mat and red suede mat combination. An open V-groove surrounds the objects. The glass covering the mats and frame is 99% UV protective. A wood black frame with silver edging was selected because it contrasts well against the mats and objects. This framed guidon was designed as a PCS gift. 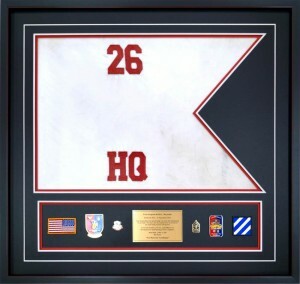 This example features a cotton custom embroidered Regimental Support Squadron, 278th Armored Cavalry Regiment guidon. The design is similar to many of the 12” x 9” custom guidon frame designs in the e-commerce store. This one differs slightly because it is triple matted using an acid-free etched black paper top mat, an etched black paper middle mat, and a red bottom mat. 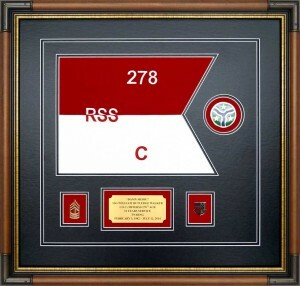 The guidon frame design incorporates the 278th Armored Cavalry Regiment Combat Service Identification Badge into the swallow tail. Below the guidon are three openings for a rank pin, custom engraved gold satin nameplate and Army Medical Corps Regimental Crest Pin. Each of the items below will influence the price of the completed frame. Oversize frames – a standard mat size is 32” x 40”. Generally, a regulation size guidon will fit into a standard mat size. However, frames that require a larger mat will be more expensive, and the mat color selection will be somewhat restricted. To get an idea about how frame sizes change the price, take a look at the different frame design sizes for the standard guidon packages in the e-commerce store. Mat color/style selection – the standard mat that we use is an acid-free paper mat. Upgrades are available to suede mats, silken mats, leather mats, and linen mats. Rich, suede mats greatly enhance the contrast of gold objects and mementos framed with a guidon. However, adding suede mats increases the cost. Also, the number of mats designed will influence the cost of the frame. The standard design in our e-commerce store uses triple acid-free paper mats. If you wish to upgrade the design to quadruple mats or textured mats, the price will increase. There is generally no additional charge for a mat color substitution. The number of objects – increasing the number of objects will increase the size of the frame. For example, increasing the number of objects that requires a second row beneath the guidon will expand the size of the frame. This raises the cost for the mats, the glass/acrylic, and the frame. Glazing choices – there are upgrades for the types of glass used in a guidon frame. The standard glass used for local customer pickups is Conservation Clear, 99% UV protective glass. The standard glazing for the guidon packages purchased in the e-commerce store and shipped is 99% UV protective Conservation Clear acrylic. A premium upgrade to 99% UV protective Museum glass or Museum Optium Acrylic is also available. Guidons are furnished for framing when a guidon has been flown under a customer’s command. In other cases, customers want to furnish a guidon that has been custom embroidered and presented to them as a gift. 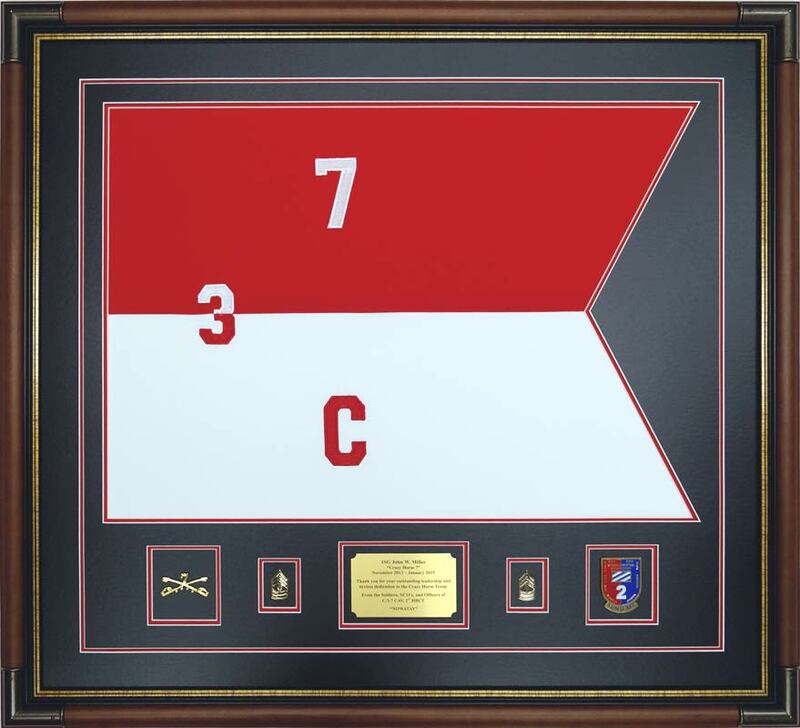 As we have previously stated, the frame designs and combinations in the e-commerce store represent the most popular framing choices for guidons. You are not restricted to the selection process in the e-commerce store. 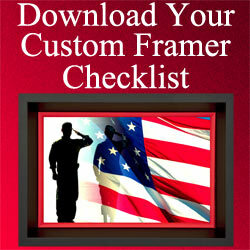 It is a simple matter to upgrade to a custom guidon framing option by contacting us. We will discuss various options to either modify or completely redesign a guidon package for you. 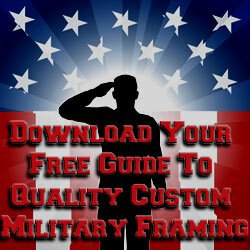 Providing custom guidon framing is one of our specialized skills. The example on the right is a custom design that is a slight modification from the designs in our e-commerce store. The 3rd Battalion, 160th Special Operations Aviation Regiment (Night Stalkers) guidon is regulation size and custom embroidered. As experienced custom guidon framers, we will modify designs to suit your needs. Or we will completely design a framed guidon based on the objects you wish to include with the guidon. In this case, the guidon is framed with triple acid-free mats. A blue bottom mat matching the guidon’s color is used to secure the objects in place. The middle mat matches the aviation guidon insignia and unit colors. A blue mat matching the color of the guidon is used for the top mat. An Army Combat Service Identification Badge US Special Operations Command is placed in the shallowtail. The objects beneath the guidon include a company challenge coin, rank insignia pin, a custom engraved nameplate with insignias, the 160th Special Operations Aviation Regiment pin, and a “Death Waits in the Dark” challenge coin. An open V-groove surrounds the objects and the guidon. 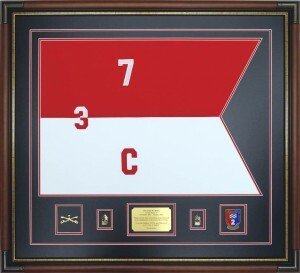 The dark wood frame with metal corner caps used for this design is one of the most popular frames for guidons. The mats and objects are covered with 99% protective UV glass. Our local frame shop serves the military framing needs along the Georgia coast and throughout the contiguous United States. You can learn more about us on our About Us Page and on our Defining Framed Guidon Quality And Design page. Call us at 912-756-2781 to discuss custom guidon framing. You may also contact us on our contact form with questions about custom framing your guidons and mementos.